Rooney | "Name On The Trophy"
Five things we learned from the Sunderland game. With the weather cold enough to make even fat Newcastle fans keep their tops on it was scarf and hat time- although definitely not snood- at Old Trafford as United took on Sunderland. Boxing Day fixtures are usually happy affairs for United with the Sir Alex Ferguson’s men taking all three points in the last seven games they’ve played on December 26th. 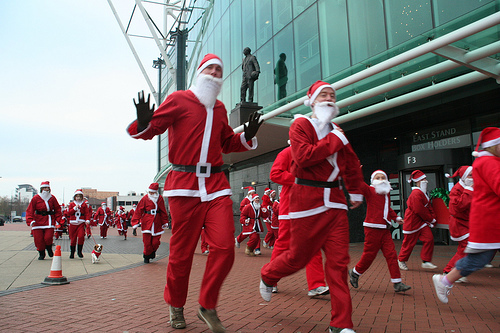 In fact if we’re going to go all stat-crazy then it’s worth mentioning United have won a staggering 15 of their last 16 boxing day games, so Christmas hangovers are a thing of the past at Old Trafford. With the in-form Danny Welbeck and midfield driving force Lee Cattermole both unavailable for the Mackems it was a game, if we’re honest you’d always fancy United to win. United have been inspired at Old Trafford this season, and went into the game on the back of five straight home wins in the EPL, while Sunderland had only won one game on the road- the awesome 3-0 demolition of Chelsea. With Nani and Scholes out, Fergie went with a midfield of Giggs, Anderson, Carrick and Park with Rooney and Berbatov up front. The back five of VDS, Rafael, Vidic, Rio and Evra is without doubt United’s strongest and Sunderland were always going to struggle to penetrate it. So what did we learn from United’s comfortable 2-0 victory over Sunderland, other than it’s now so cold even Mickey Phelan has stopped wearing shorts and Anton Ferdinand must have nightmares about trips to Old Trafford? 1. Anderson is the greatest player in the history of world football. Okay so I may be doing a bit of Gareth Bale type over-exaggerating but the stocky Brazilian is fast becoming the name on every United fans lips. The term ‘barnstorming performance’ was in danger of becoming the exclusive property of Darren Fletcher but such has been Anderson’s displays of late, that he’s now overtaken Fletcher as the one midfielder who has to start. Against Sunderland he picked up where he left off against Arsenal and Blackburn- dominating the midfield with tough tackles, sublime passes and driving runs. If a shot that hit the bar had of gone in then it would have been a 10/10 performance rather than a 9/10 one. The looking the one way and passing another which he first treated Old Trafford to in the 4-0 demolition of Arsenal a few years ago, was used with aplomb to set up United’s second goal and is now number one in the list of tricks being tried in the playgrounds of Manchester. Probably. If Anderson carries on like this we’ll have to change the dog’s name from Wazza to Ando, as like Chicharito at the beginning of the season, Anderson is getting everyone at Old Trafford buzzing and could well hold the key to a 19th title. 2. Rafael. Do I need to say more? It seems every time I write one of these articles, Rafael’s greatness is mentioned and it’s happened again. The other Brazilian in United’s line-up is having the season we all knew he could do as unlike some United youngsters, nearly every fan I spoke to at the start of the season believed he was good enough to make it. Going forward Rafael is Evra-esque and his defensive game, while not perfect has come on in spades. When Patrice Evra is in danger of being the second best full back on the pitch then it’s quite possible I’ve died and gone to heaven. Rafael is now United’s right back, no matter how much I love Wes Brown, the time for change is over. Rafael Da Silva is the one. Poor Phillip Bardsley must’ve felt like he’d entered the seventh circle of hell as both Park and Rafael gave the poor Salfordian no respite down United’s right side. When he went down and signalled for the physio, 70 odd thousand fans held their breath as he’s one player United need not just in the busy Christmas period but for the rest of the season. 3. Park is going to be missed. Remember the energy of the 2007/08 side when the likes of Rooney, a certain Argentinean and Owen Hargreaves covered so much of the pitch it was often as though United had an extra man? Watching Ji Sung Park giving his all over the last few weeks has reminded me of that time- especially when he’s backed up by Rafael. Park has recovered from his World Cup hangover to become one of United’s most impressive players. It’s not just energy the South Korean brings but also important goals, and an underrated high level of skill. Park has the ability to get himself out of trouble with quick feet when needed and is always an option for someone looking for a red shirt to pass to. 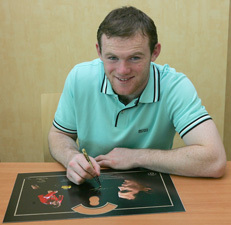 Against Sunderland Park was his usual energetic self whose link up play with Rooney and Berbatov was excellent. He may not have the skill of a Nani or the pace of a Valencia but that shouldn’t detract from the fact he’s still a world class player. The seven games without Park, United potentially face when he goes to the Aldi Cup will be a lot more difficult without him in the side. 4. Giggs will -still- tear you apart. Someone needs to check Ryan Giggs’s birth certificate- and no I’m not talking about the drivel City fans used to sing. The reason I think it’s time to check the Welshman’s date of birth is that there’s simply no way he can be 37 years old. Giggs has been one of United’s best players this season and was at his awe-inspiring best against Sunderland. Running at defenders, using his wide range of skills and picking out sumptuous passes, Giggs was at his very best and gave everyone a reminder of just how much he’s going to be missed when he finally retires. If Giggs carries on in this vein though, he’ll probably be hitting his best form in 2019 when he’s 45 so there’s no need to panic just yet. 5. Berbatov and Rooney are becoming unstoppable. Although Rooney may only have one league goal this season, there’s no denying that he’s hitting top form performance wise. Wazza looks like the player that helped Ronaldo bag over 40 goals in a season, dropping deep when needs be, leading the line when called upon and showing the sort of selflessness you’d associate with Santa Claus. Had a chip that went just wide of Craig Gordon’s goal ended up in the back of the net then Rooney would have been grabbing all the headlines after the Sunderland game. As it is an assist for Berbatov’s first goal and an all round excellent performance had many fans and pundits alike noting that Rooney’s back to his best and it’s only a matter of time before he starts scoring. If I was either Ben Foster or Scott Carson, I’d be very, very worried. As for his strike partner despite being dropped for the Arsenal game, top scorer Berbatov isn’t prone to sulking or tantrum throwing like some of his counterparts across the city. The Bulgarian showed that given the right service and encouragement he’s as deadly as any in the game. Rooney may still be United’s talisman but with 13 league goals, Berbatov is the man most defences are struggling to cope with. With a heavy Christmas schedule on the horizon for all Premier League teams although it’s nowhere near ‘squeaky bum’ time, the next week or so could well decide the title race. Although titles aren’t, at least historically, decided in December, with four games in nine days, there’s no denying that it’s a crucial part of the season which could potentially see United obtain a commanding lead. Sir Alex Ferguson has set his team a target of being top by the end of the Christmas fixtures on January 4th. Sir Alex stated: “My aim is to try and be top by January 4. “By that time, the top of the league will have taken shape. With home games against Sunderland and Stoke and away fixtures to WBA and Birmingham, all United’s festive matches fall under the ‘tricky’ category but there’s no reason why we can’t win all of them. While a trip to St. Andrews has draw written all over it for practically any club, except Chelsea who lost of course, if United were to take ten points from a possible 12 then it would still be a good return and could well see United stay on top of the EPL. There’s no doubt though if United are to enjoy a productive New Year, then some of the fringe members of the squad are going to have to prove their worth and this is where United could hold an advantage over their rivals. The United squad is one of the strongest in the league, with each position having at least two internationals vying for it. Take the strikers for example, with Rooney, Berbatov, Chicharito, the recently returned Michael Owen not to mention Kiko Macheda all available for selection. Having five strikers is no use to anyone if they’re not of a high standard but all of United’s front men could arguably walk into nearly any Premier League side. Only Macheda who’s still a long way from the finished article and Owen who’s fitness still remains doubtful have question marks over whether they could start for the Reds. The midfield is one area many United fans were hoping Sir Alex would strengthen in the Summer, with Rafael Van Der Vaart and Mesut Ozil being mentioned so much by many Reds, I actually thought we’d signed them both at one point. While I still have my worries as to whether the current central midfield has enough truly world class players in it to take on the likes of Barcelona, there’s still enough quality to overcome most teams. Fletcher, Carrick and Anderson are on their day, capable of dominating any game. There’s also Ryan Giggs who can be deployed in a more central area if needs be. With Park, who’s available for the Sunderland game before he departs for the Aldi cup, Nani, Obertan and Bebe not to mention Giggs, then there’s enough players to cover the wide positions certainly against the likes of WBA and Stoke. Another concern surrounding United’s starting XI is in the central defensive positions, mainly the absence of either Rio Ferdinand or Nemanja Vidic. While Chris Smalling has exceeded many expectations, Jonny Evans has had something of a torrid time of late and can no longer be trusted on current form. Admittedly the best way to help the youngster get over it may be to throw him back in the mix- but he’s looked so out of sorts lately I’d actually prefer to see either Smalling or Brown replace Rio or Vidic if one of them is rested. United look much frailer at the back when Ferdinand isn’t there, I’d even go as far as saying he’s more important to the defence than Vidic- although only just. Despite Vidic wearing the captain’s armband, Rio is the true organiser at the back and he does a job that’s second to none in marshalling his defensive troops. As for the full back positions, well with Evra the Da Silva twins, not to mention Brown and O’Shea, there’s enough there to cope with the fixture congestion- who knows Fergie may even give Gary Neville his 500th League game, although I’m not to sure now is the time for nostalgic generosity. Things aren’t looking quite as rosy at United’s rivals; Chelsea skipper- the lovable -John Terry recently questioned whether his side have the strength in depth to cope with the busy Christmas period. Carlo Ancelotti has been quick to play down Terry’s statement- shades of Capello in South Africa- claiming the Chelsea squad is in fine shape. The results speak for themselves and no wins in the last five games, gives credence to Terry’s observations. Arsenal- Chelsea’s opponents on Monday- have their own problems to contend with- none of which have been helped by the more vociferous among United ranks. Arsene Wenger was quick to rubbish Nani’s recent claim that it was only Chelsea and United involved in the title race. Only a week earlier it was Evra upsetting everyone at the Emirates by claiming Arsenal were a “training centre” with few title credentials. Wenger would do well to worry about the comments of his own players before worrying about those coming from Old Trafford. Future Arsenal star Cesc Fabregas claimed his team were ‘scared’ following their recent defeat at Old Trafford and with Chelsea winning the last five contests against the Gunners, scared is the last thing Arsenal can afford to be. The only other real title contenders are our friends from M11, who have tricky trips away to both St James’s Park and the Emirates over the next 11 days. City seem like a club in disarray despite being in third place. With the on/off Carlos Tevez saga, Balotelli doing his best to endear himself to everyone in world football and the recent home defeat against Everton, all is not well in the house that Sheikh Mansour’s money built. The fact that Arsenal play both Chelsea and City means that at least one of them are guaranteed to drop points over Christmas and with a bit of luck it might even be all of them. The notion that there are no easy games in the Premier League anymore may well be true, but there are ‘easier’ games and the four United have over Christmas would certainly fall into that category. With the United squad in fairly decent shape- bar long-term victims Valencia, Hargreaves and a short-term problem to Paul Scholes, a set of winnable fixtures and good recent form, there’s every reason to hope this could be a very merry Christmas at Old Trafford. Wayne Rooney’s statement was delivered to the world’s press yesterday with the sort of fanfare usually reserved for general election results or the announcement of who’s been voted off the Xfactor. Within minutes of Rooney releasing his excuse, sorry, reason for wanting to leave Manchester United, millions of United fans around the world were analysing every word, sentence and nuance to see what exactly was going on in the mind of the player formerly known as a fan’s favourite. While it’s quite obvious Rooney didn’t sit down in front of his Macbook and write the statement himself before emailing it to the press, it’s obviously the crux of why he wants to leave- at least in public. So what did Rooney’s statement tell us? Well he wants to leave that much is certain but are the reasons for him leaving valid? Looking over the statement fully, it seems as though Rooney’s memory and argument is just a tad selective to say the least. “I met with David Gill last week and he did not give me any of the assurances I was seeking about the future squad. Here seems to be the main argument, in fact you could say it’s the only argument Rooney is making, that United cannot continue to attract the top players. Well that would indicate that in the past United have attracted the world’s top players, yet is this the case? 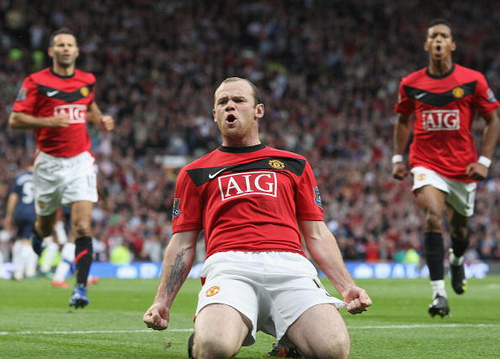 Looking back over the past six years, since Rooney joined United, the players who’ve come to Old Trafford have not always been the best in the World, but have more often than not grown into that bracket. Some of United’s best signings during this period have not necessarily been ‘stars’ as such-although they certainly are now. Fergie’s most astute signings in the period since Rooney joined United were arguably Edwin Van Der Sar, Patrice Evra and Nemanja Vidic who went to Old Trafford for a combined fee of around £14.5 million and United had little competition for their signatures. United have spent big money on the likes of Anderson, Nani, Michael Carrick, Owen Hargreaves and of course Dimitar Berbatov and there’s no denying that these players were all sought after but were they considered among the ‘top players in the world’? Anderson and Nani were seen as potential future stars, while Carrick was a highly thought of England fringe type midfielder whose £18.6 million fee left many feeling United had overpaid slightly. As for Hargreaves, he certainly was considered a top midfielder but even before he went to United, his injury problems were well documented. As for Berbatov, he was a shining star in the Premier League and the noisy neighbours were certainly interested, but it’s questionable as to whether he was really considered one of the world’s top strikers. He was probably a rung below the likes of Rooney, David Villa, Samuel Eto’o and Fernando Torres as being one of the truly top strikers in world football. Of course there was also a certain gentleman from Argentina who arrived, but the fact he was signed on a loan deal from West Ham or whoever the fook owned him, speaks volumes as to his standing in world football at the time. The point I’m making is that since Rooney’s arrival United’s signings have often been ones that will grow in time, or players who aren’t quite attracting the rest of Europe’s elite but are still capable of doing a good job. Rooney’s argument that he wants to leave Old Trafford because he doesn’t feel the club will ‘continue to attract the ‘top players in the world’ is slightly flawed as United often don’t really go for the very top players. Fergie has been bitten once with Juan Sebastian Veron who was considered one of the world’s best midfielders and came with a price tag that seemed to underline that fact to the tune of £29.1 million. However Veron’s time at Old Trafford was something of a disaster and he ended up leaving for just over half that fee, mainly due to Chelsea’s reckless spending in the early phase of the Abramovich era. When Rooney claims its anxieties over the ability of the club to attract the world’s top players which is making him leave, it’s as though he wants Fergie to change his whole transfer policy and suddenly start bidding for big name players. Let’s not forget even a certain Cristiano Ronaldo was not a real star when he arrived at United- in fact I along with more than a few other fans were disappointed when we learnt it wasn’t the man now known as ‘Fat Ronaldo’ that was signing. If Fergie had gone out last summer and spent £40 million on the likes of Joleon Lescott and Emannuel Adebayor would that have convinced Rooney of United’s ambition? Perhaps a £45 million bid for Zlatan Imbrahimovic would have made the scouse striker stay. The only problem with any of those signings is they’d arguably not improve United’s team one iota and been a complete waste of money, but hey at least it shows ambition. To be fair to Rooney he’s actually not the first talismanic striker to leave Old Trafford due to a percieved lack of ambition by the club in regards to transfers. Of course there’s a world of difference between Eric’s retirement and Rooney’s desire to leave for greener pastures. After all Cantona wasn’t seeking more money elsewhere, or a club with more ambition, he’d more or less had enough of football and the lack of signing top players was simply one of his reasons. The fact Fergie sympathised said it all, at that time -1997- United hadn’t been ambitious enough in the transfer market. However the signings of Jaap Stam and Dwight Yorke, less than a year later would certainly address that issue. The reason I mention Cantona’s comment is because it’s worth noting that Rooney hasn’t been the only one who’s had thoughts like that while being United’s star player. However, Cantona was leaving football altogether and was at a club that hadn’t won the CL twice in the past 11 years not to mention the league 11 times out of 18. There’s similarities between the two statements but there’s also a lot of differences, especially in the context of the times they were made. The final part of Rooney’s statement, arguably is the most contradictory. For me it’s all about winning trophies – as the club has always done under Sir Alex. Because of that I think the questions I was asking were justified. If Fergie’s a genius and United have always won trophies under him, then why does Rooney want to leave? Fergie shows no signs of retiring for at least the next few years and as he’s stated himself his health is fine. Had Fergie announced he was retiring at the end of this season or even the next one, Rooney’s statement would make sense, but he hasn’t so it doesn’t. Rooney’s statement has been seen by some as simply yet another reason why the Glazer family have to be removed, after all, it’s surely the debt they saddled the club with that’s caused Rooney to believe the club can no longer compete. However, while the debt and the interest are a joke, Rooney seems to have forgotten that United are not usually ones for making record-breaking bids for the world’s top stars. Although, Fergie has been willing to splash that sort of cash on occasion- Rio Ferdinand, Rooney himself, it’s been extremely rare and not happened at all of late. Whether more will come to light as to how much wages and signing-on fee have dictated remains to be seen but Rooney’s argument that United lack the ability to attract top players, seems a little hollow. 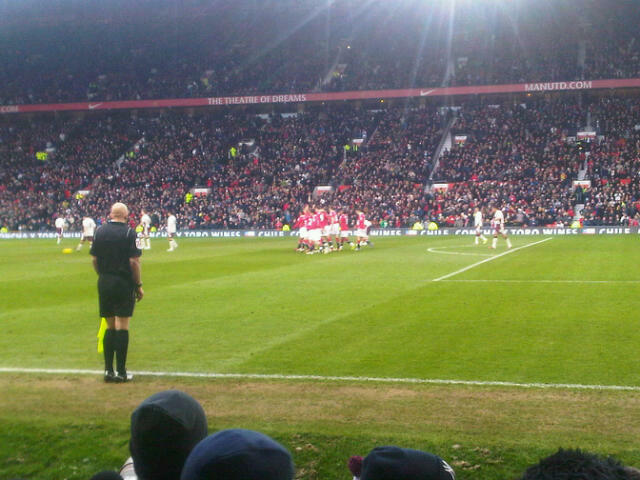 Another United away game another draw, it’s becoming something of a tradition this season for Fergie’s men. However unlike the previous two away games United didn’t throw away a lead- but don’t worry there were still the usual defensive errors to talk about. While it would be fairly easy to copy and paste the last two ‘things we learnt from United’s away game’ there were still a few new realisations to talk about- or maybe just a reiteration of what we already knew- or how about a revision of previous thoughts seeing as were on words beginning with ‘r’. It’s becoming increasingly frustrating having to see the same mistakes and obvious faults go unaddressed and this weekend would have -finally- been a chance for United to take full advantage of a Chelsea loss. However although from a United point of view it is disappointing, it’s not all doom and gloom, there were still some positives to take from the game although the faults cannot be ignored. So what did we learn other than the fact even in a brand new multi million pound stadium standing up can cause problems? The two Jonnies cannot play in the same back four. While Patrice Evra is not quite back to his best and other players make mistakes, messrs Evans and O’Shea are becoming something of a worry, in fact that’s a bit like saying Malcolm Glazer isn’t on every United fan’s Christmas card list. Let’s start with my personal favourite John O’Shea, for many years now he’s been a fringe player used sparingly and only brought out for special occasions -usually against poor teams- a bit like putting away the nice china and bringing out paper plates for guests you don’t really like. Due to injuries and a case of mild insanity by Sir Alex Ferguson O’Shea has found himself as United’s preferred choice at right back. Now while I loved the last minute winner in front of the Kop a few years ago, I’ve always thought O’Shea is quite simply not good enough for United. I know that may seem harsh after all he’s been at the club since his youth and I don’t know if I mentioned it but he did score a winner at Anfield but for me its true. O’Shea just seems to be a six out of ten player at best- giving the ball away needlessly, failing to meet passes and being a general weak spot in what is -usually- a reliable United defence. Against Bolton his lack of ability came to the fore once more. It’s not O’Shea’s fault he’s not up to it, he’s United through and through but unlike some players who have the ability but struggle with the consistency, O’Shea seems to actually not be very good at football. Just ask yourself how many top teams would O’Shea walk into compared with the rest of the United side? Not many. It’s got to the point where I’d rather see Owen Hargreaves wheeled out and dumped in the right back position than be forced to endure O’Shea again. Surely its time to hand the spot back to Wes Brown on a regular basis- or even give Rafael a chance. That brings me on to Jonny Evans who really and truly needs ‘resting’ or ‘dropping’ if were not going to sugar coat it. Unlike O’Shea I feel Evans is a naturally gifted defender who is good enough to play for United. Let’s not forget that between him and Gerard Pique, Evans was considered the better prospect and seemed to progress quicker. The problem for Evans is that he’s been thrown into the United side almost regularly when by rights he should only be playing the minority of games. If Rio Ferdinand hadn’t had his injury problems we’d probably be commenting how Evans is a reliable back up and a future United starter. Yet because Evans has been forced to play week in week out for practically two seasons, his failings have been exposed. Unlike a young striker who can score a goal then miss a few chances and still be praised every mistake Evans makes comes under scrutiny and is often costly. Teams now seem to target him as a weak spot, against Bolton he didn’t have the worst game but with him and O’Shea both in defence it looks dodgy to say the least. There’s even been rumblings of giving Chris Smalling a start which says it all really, of course if Fergie had played Rio Ferdinand instead of resting him then it would be a totally different story. However with question marks still remaining over much United can really rely on Rio -I do love the letter ‘r’- Fergie may have to consider another option in central defence before its too late. United need a real plan B on the left wing. Ryan Giggs on his day is still one of the top performers in the EPL and despite his age can still do a job against any team. The problem is that if Giggs is injured or needs resting United don’t seem to have a truly viable replacement on the left. We saw it against Bolton when Giggs went off, part of the problem is the injury to Antonio Valencia has now given Nani the right wing position whereas in the past Fergie was partial to sometimes playing him on the left allowing him to cut inside. Now though- and I realise its only been a couple of games, its seems as though Nani is being deployed exclusively on the right. While I actually prefer to see him in that position it does mean a lack of alternatives on the left. One answer may be to put either Ji-Sung Park on the right and Nani on the left when Giggs is out or even try Anderson on the left wing. However Anderson hasn’t really been a winger since his Porto days and Nani performances on the right are at times awesome. Maybe Park could be used as a straight replacement for Giggs but I doubt it. My suggestion would be to actually roll the dice and let either Gabriel Obertan or even Bebe have a go when Giggs is out. They may be young and fairly untried in the first team- especially Bebe- but why not just give it a go? If it doesn’t work then other options can be examined but throughout the years Fergie has often gambled on a youngster to reap the rewards now may be another time to give it a try. 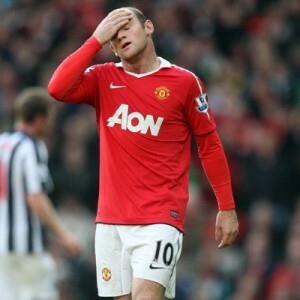 It’s time to give Rooney some real time off. Before you start screaming either ‘United need him!’ or ‘He’s been rested he’s got a job to do!’ allow me to explain. Rooney’s ankle has not been right for several months now- in fact you can take the word ankle -and the ‘s’ after Rooney- out of that sentence. He’s struggling and while a couple of weeks ago I thought he may have turned the corner it’s become obvious he hasn’t. The sight of him with an ice pack on his ankle a the Bolton game said it all, against Rangers he seemed to pull up because of it and you could almost hear 70 odd thousand gasps. What I’m suggesting is actually a couple of weeks rest and recuperation not anything to do with his extra-curricular activities and shielding him from those nasty mean opposing fans but simply get him back to real fitness. Dimitar Berbatov has picked up Rooney’ mantle and United also have Michael Owen, Kiko Macheda and Chicharito – not to mention the option of returning to a 4-5-1 formation with Anderson or Michael Carrick- remember him- back in the side. Don’t get me wrong I’m aware of how valuable Rooney is and how resting players at United has often backfired but I fear if Fergie doesn’t give him a break it may take a lot longer than a couple of weeks before we see him back to his best. United gained a point. With all the usual hyperbole I’ve been hearing- and spewing- about shoddy defending, points dropped and over-reliance on Paul Scholes -again-it seems something has been forgotten. While a draw at Bolton is nothing to get a tattoo about, it’s not the end of the world. Chelsea lost. United drew. Unlike the previous weeks where Carlo Ancelotti’s men have moved a little bit further away from Fergie’s, this time United made up ground. Okay it’s frustrating to fail to win a third away game on the bounce but at least there were some positives in the fact that United were able to twice come back from behind and show some fighting spirit rather than throw away a lead. I know it’s not much to hang on to but we’ve got to have a little bit of positive thinking -after all it could be worse, United could have been beaten at home by West Brom.